Summer has so many good vegetables. I mean, so does winter. I'm only saying. Something about putting together a summer meal feels a little lighter and airier, maybe. I'll just toss in a bit of freshness and a pinch of goodness and we'll all just hang out in the kitchen and laugh and have a late dinner. Right? It could have something to do with the fact that we're barefoot and sun-tired and stuff like that, and even though cooking in the winter feels a little heartier (and a bit more hibernation-urgent), working with summer produce makes me feel more like this, while winter leaves me a little, well, this. But that could just be the thought of snow talking. I'm a big fan of throwing together a pasta dinner with what we have going on from the farm. It the summer (or maybe ever), it's pretty hard to go wrong. But especially in the warmer months when you've got a bounty of tomatoes and lots of pretty greens, you're just in for something pretty exceptional. This is one of those dinners where there doesn't have to be a lot of rules, but you can always swap out the chard for spinach or kale or roast eggplant instead of tomatoes. Whatever you have on hand will do. 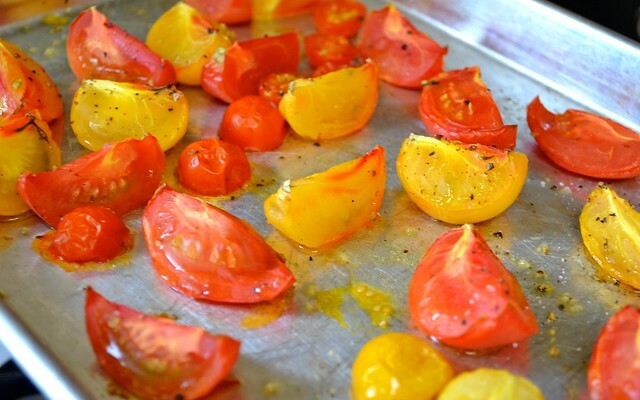 Start by prepping your tomatoes for the oven. Preheat to 375 degrees. 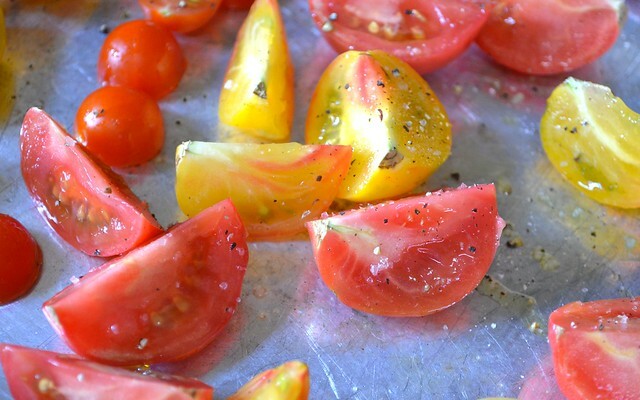 Cut your tomatoes into wedges and place them, face side up, on a large baking sheet. Drizzle with olive oil and sprinkle with salt and pepper. Roast for 45 minutes to 1 hour (I know, but it's worth it!) until they are oozy and sweet. When your tomatoes are almost done, set your water on to boil in a large pot. Salt it well and cook your pasta according to the package instructions. 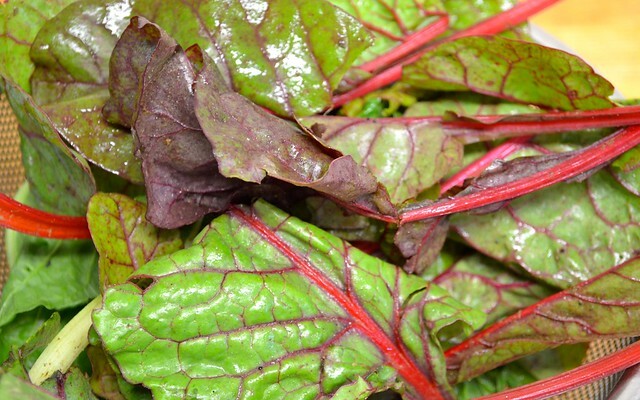 Meanwhile, you can get started on your greens. In a large pan, get some olive oil heating on medium high. Add your garlic cloves (crushed, but still whole) and stir for 1 minute or until the smell starts to permeate. Add your onions and continue to sauté until they start to soften. Add your greens and allow them to wilt, adding seasoning as you wish and waiting until the last possible moment to add your oregano -- if you're using dried, you can add it in during the garlic-and-onion phase. 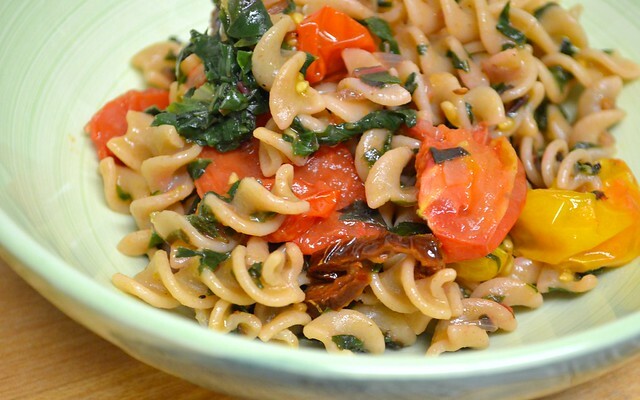 When your pasta is about one minute from being cooked, remove from heat. Reserve about 1/2 cup of your pasta water and set aside. 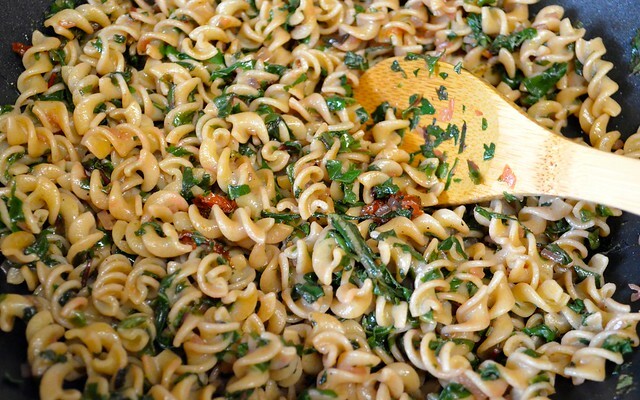 Drain your noodles and then add to the pan with your chard, onions and garlic. Remove the tomatoes from the oven, which should be looking beeeeeautiful, and add those as well. Toss together until the tomatoes are evenly distributed throughout. And, ta-da, you are officially and excellent summer cook! Because those few and easy to find ingredients are all you need for a dish that's light and still full of ripe, seasonal flavor.